Home > US Sports > NFL > Is it in the Browns Best Interest to Re-Sign Brian Hoyer? Rumors are starting to surface that Brian Hoyer will have no interest in signing any deals with the Browns if Johnny Manziel is still on the team. Hoyer was quick to shoot these rumors down. Wednesday Hoyer said these comments. “I just want to address what we talked about the other day. I’ve said I need to say about the topic, but after (a Cleveland-area reporter) mentioned the report, I wanted to see it for myself. “It couldn’t be further from the truth. There’s no accurate information in it. I’ve never talked to that guy in my life (the Bleacher Report guy)From here on out my main focus is Jacksonville. Joe Linta has said he hasn’t spoken to the Browns since the spring, but he understands why Cleveland would want to see a larger body of work. Linta is also the agent for Ravens quarterback Joe Flacco. He had Joe wait until the end of the season to show Baltimore what he is capable of. This lead to a super bowl MVP, and a six-year 120.6 million dollar contract. Now with the roster Cleveland has now, Hoyer wont be winning a super bowl, but he has a great chance to prove to the Browns organization that he has the ability to win football games. Hoyer is a Cleveland kid, who grew up dreaming to play for his hometown team. Last season he finally got the opportunity. 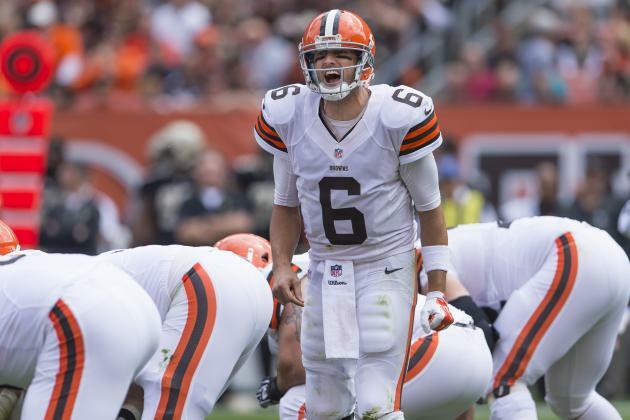 After winning his first two starts in orange and brown uniform Hoyer went down with a torn ACL. During the offseason the Browns drafted Johnny Manziel from Texas A&M. 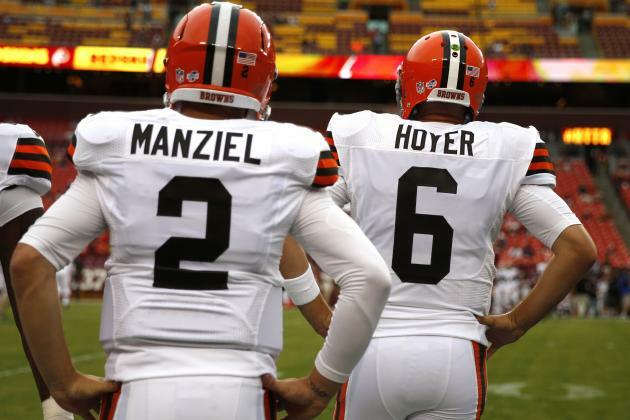 Many people thought Manziel should start, but Hoyer beat him in the QB battle. Brian is really proving to the coaching staff and the city of Cleveland that the right choice was made when he was called upon to start. Hoyer is doing really well this season, the Browns are off to a 3-2 start. If it wasn’t for poor defense their record may even be better than that. Hoyer leads the NFL with an average completion of 13.6 yards. He has thrown six completions of 40-plus yards, and has a passer rating of 99.5. Brian has really proved himself to be clutch as well. His first start he drove the ball down the field and found Jordan Cameron in the end zone to steal the win against the Vikings. He has also done it twice this season. Against the Saints Hoyer found Andrew Hawkins wide open down field which led to the game winning field goal. Against Tennessee Hoyer and company led the largest comeback from a team on the road in NFL history. After being down 28-10 at half, Hoyer rallied the troops and made a 25 point comeback to win the game. With a very easy schedule coming up (Jacksonville, Okland, and Tampa Bay) it is very possible the Browns can be 6-2. If Brian Hoyer keeps these winning ways up the Browns will need to make a tough decision. Do they stay with the 29-year-old quarterback who has been able to get the job done. Or do they pull the trigger and play Manziel? Brian Hoyer is the only quarterback for the Browns (since their return) to have a winning record. So it would only be smart to lock him down long-term rather than put all your trust in an unproven rookie. With this being said, another question may rise. How much do you pay him. Kansas City gave Alex Smith a four-year $68 million dollar extension ($45 million guaranteed) and Andy Dalton received a six-year $96 million dollar deal. Do you risk it and sign him to a larger contract, or do you try to get him for less money. If he keeps this winning thing up, Cleveland will have a tough decision to make. It may be in their best interest to sign Hoyer and keep this hometown kid playing for his childhood team. Khan vs Brook, Khan We Just Get The Fight On….Please?